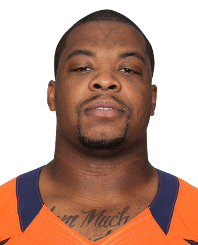 Earlier this week, Broncos defensive tackle Terrance Knighton created some buzz in the football world when he "guaranteed" a Broncos Super Bowl appearance—and victory. "It doesn't matter what happens. At the end of the year, we're hoisting that trophy . . . I don't care if New England doesn't lose again. I don't care where we have to play. I don't care who our opponent is. We're not going to be satisfied until we hoist that trophy." I didn't guarantee a super bowl win. I just said I don't give a f**k who we play. We as a team have one goal. Being super bowl champs. Regardless of if it was a guarantee or simply a stated goal, Knighton's words created a firestorm. On Monday, Patriots quarterback Tom Brady responded to Pot Roast's remarks. "My dad always told me, 'Well done is better than well said,'" Brady said in his weekly radio interview on Westwood One, via ESPN. "In the meantime, we have a lot of football left to play . . . there's still two very important games remaining on our schedule, and that's what my focus is on." Brady was diplomatic, paying respect to Knighton. "Pot Roast is a big man, so I would never say anything that would get him mad at me. But I will just say there is a lot of football left to be played. [Denver will] have their chance and we'll have our chance, and we will do our talking on the field." Knighton, a 6-foot, 3-inch tall 331-pounder, gained national recognition after sacking Brady in last year's AFC Championship game in Denver. The Broncos went on to win, 26-16. Though Denver got the best of Brady in last year's playoffs, the Patriots thumped Denver in New England 43-21 in November. Currently the No. 1 and No. 2 seeds in the AFC Playoff race, the Patriots and Broncos are the favorites to meet again in this year's AFC title game. But, as Brady said, there's a lot of football left to be played between now and then. Anything can happen. It's safe to say Knighton likes Denver's chances.